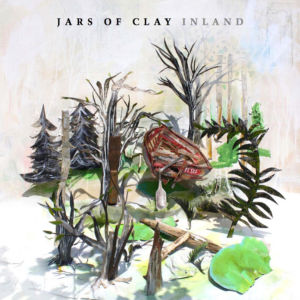 Jars Of Clay – Inland | NoCoda. What It Sounds Like: Beautiful, alternative pop rock with bits of acoustic, folk, and experimentation that are continually being updated by these CCM veterans, this time with lush string sections playing a substantial part. Inland sounds original from track to track, but completely familiar in the exact same breath, making for a musical and lyrical journey that simply takes you…further. Still love in the hard times. There’s simply too much goodness on the eleventh Jars Of Clay record to even know where to begin. There are so many stones to uncover, nooks to explore, and lyrics to lose yourself in. It’s not even my favorite song on the record, but let’s take the wonderous Human Race as a starting example: It begins very familiar for any Jars of Clay fan (mid tempo, acoustic), before taking on an almost Postal Service vibe in the verses, while a plucking banjo takes us into chorus. This floats along into the night sky, before a vintage blues guitar solo slithers into the split-time bridge, with a final adding of a sad, lone horn to the final chorus to finish us off. That may sound overly complex; like too many cooks in the kitchen. But that would be far from the truth, as it flows seamlessly and effortlessly across the airwaves, and get this: nothing else on the record sounds even remotely like it. Inland is the sound of a band with experience under their belt, as the melodies are unmatched, and the looks at many of life’s struggles are presented in anything but a come-and-go friendly format. Do you remember what the city sounded like? We’re here tonight / So let’s make it all it was meant to be. Almost equally haunting and powerful is the U2-esque ballad, Love In Hard Times, which sounds completely different from the R.E.M. meets Interpol meets (ahem) Jars Of Clay first single, After The Fight. It means, that at the end of the day, and after repeated listens, this very well may be my favorite Jars Of Clay record to date. It’s a pretty big claim, and I wrestled with it for a while. That groundbreaking self titled record? The Long Fall Back To Earth? Who We Are Instead? Goodness, is it really better than The Eleventh Hour? I’m going out on a limb, and as shaky as that limb may be, I’m going to pull a Death Cab For Cutie and claim this as a fact, and vote that yes, that this is the best Jars Of Clay record. Other records may be stellar, but this is the most complete; the most thorough from start to finish. When you’re eleven records into your career, and you make your career defining record that all further efforts will be judged by, you know what score you’re getting. They’re few and far between, but Inland deserves a ten – it can’t live with anything less. If you had to listen to two tracks: You could take numbers one and two from the following list as the recommendations, but just for the fun of it, I’m going try to rank these tracks, from my favorite to least favorite. How is that possible to do, you may ask, on a record that was just given a perfect score? The short answer: it’s not, but we’re going to do it anyway. Whatever you do, even though it’s coming in at #12, make sure that you don’t miss Left Undone. The record would be lost without any one of these essential tracks.